I’ve been blogging for over 2 years now. It’s been kind of sporadic at times as I’ve worked at finding how blogging fits alongside of my work as a Worship Leader & World Vision Artist. While the content and direction of my blog continues to evolve, I’ve enjoyed getting my feet wet in designing my own blog with some very helpful tools. My blog is based on WordPress technology, one of the best blogging platforms available. Within WordPress, the structure and form of my site is created using Standard Theme. The longer I use Standard Theme, the more I become a fan. I’m not a developer and code geek, so Standard Theme really helps out with the behind-the-scenes stuff required to create a blog and website. I’m still working on customizing things as I learn how, but Standard Theme jump-starts the process and gets things up and running quickly. A couple months after I purchased Standard Theme, the creator started a new blog called Tentblogger. Tentblogger.com has been an invaluable resource to help me set things up and make sure my blog is working as it should. Designing and maintaining a website can be very expensive. I’ve found that with Standard Theme and Tentblogger.com, although I’m a novice, I’ve been able to pretty much do everything myself. When I’ve been stumped, I’ve been able to ask questions on Tentblogger.com and get helpful solutions. If you’re thinking about starting a blog, seriously look at Standard Theme. For $99 you get Free Technical Support and Version Updates for Life. Plus, if you have more than one blog, once you buy it you can use it on all your sites. It’s so very very cool! 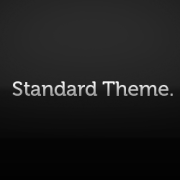 CLICK HERE to see more about Standard Theme! Are you a blogger? What technology and tools are you using?